10.01.17 - Today the Scottish Government launched a final consultation into their expected 2018 Planning Bill. The consultation paper “places, people & planning” sets out twenty proposals for change which aim to strengthen the planning system and support sustainable economic growth across the country. We encourage everyone to get involved and submit a response before the April 4th deadline - click here to respond. 22.12.16 - LDP Appeal Rejected! Following 4 years of campaigning and incredible community engagement in the 2016 LDP process, the final appeal against Braehead was today rejected. The Local Development Plan is at the core of the Scottish Planning system and the community in Auchattie, Banchory and Deeside have shown incredible commitment to stay engaged in the process in the face of repeat planning applications and appeals. This plan will now come into force early in the new year and the next phase of consultation will begin during 2018. Stay tuned! 09.11.16 - Braehead Planning Appeal Rejected! The unanimous decision by Aberdeenshire Council to reject planning permission at Braehead will stand. We are delighted that the Scottish Government reporter has agreed with the planning department, community and all Aberdeenshire Councillors in upholding the original decision. We hope this serves as strong message to Mr Duncan that major development is truly not suitable for Braehead. The Banchory community has never been more united in taking a stand against over-development in the area and we will remain united in protecting this site into the future. Thank you to everyone for your incredible support, but stay tuned, the fight continues. 11.08.16 - Today an article has been published shedding light on the inappropriate dealings that have gone on behind the scenes in the Braehead case. This is of great concern to us as community members and stakeholders in the future development of Aberdeenshire, but also to communities across Scotland trying hard to engage in the planning system. The type of lobbying and ad-hoc intervention exposed points to undue access and influence within the planning system, in this case by a member of the government’s own advisory group. The approach to senior officials and the subsequent assistance provided will give the public the perception that it is possible to expedite the approval of a planning application in which a government advisor would directly benefit. We believe it is because of cases such as this that there is a growing public perception of corruption in the development sector. This is a major factor contributing to the lack of community engagement in planning and is something the government must address immediately. 29.07.16 - Braehead landowner and developer Fred Duncan has formally lodged his appeal against the unanimous decision by Aberdeenshire Council to reject planning permission for 300 homes at Braehead.This is the second appeal we are facing in less than a year, following two repeat planning applications that were each unanimously rejected by the Council. The appeal documents will be steadily uploaded on to the government’s DPEA website in the coming days (ref # PPA-110-2309) and we will post all the relevant information here, including important web links and the deadline for public comment. We must stay motivated to fight these mercenary and aggressive tactics. Our community has broken the mould by remaining fiercely committed to fighting a repeat application and is a great example for others across Scotland. 28.04.16 - Planning Permission Rejected! Once again Aberdeenshire Council have listened to the community and planning department in voting to unanimously reject planning permission at Braehead. We have been campaigning against Sandlaw Farming’s plans since 2013 including the major negative impacts of repeat planning applications and aggressive development tactics. Repeat applications such as this serve only to clog up the planning system, disenfranchise communities and act as a no risk gamble for developers. Approving development at Braehead would have gone against the entire purpose of the planning system, running roughshod over the current and upcoming local development plans. 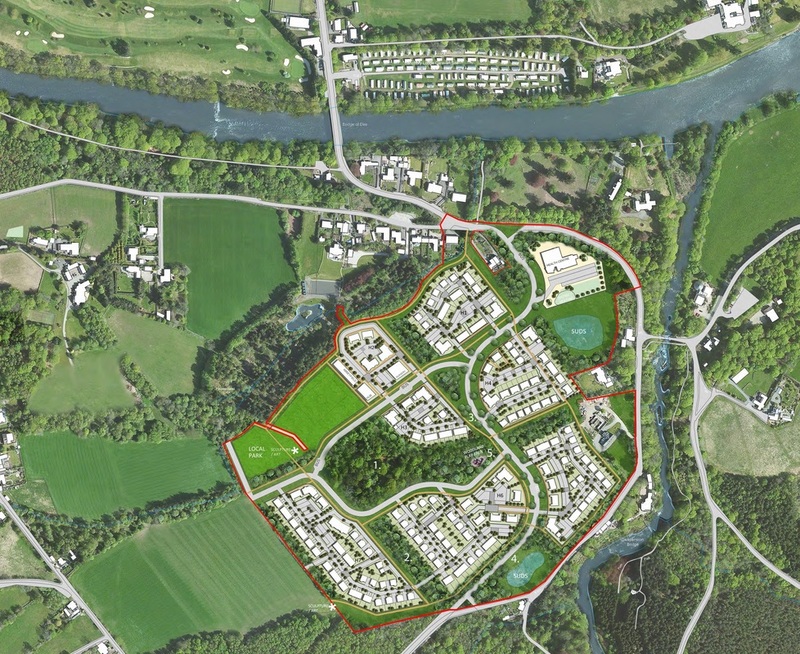 These plans have set out a sustainable future for local growth in Banchory and time and time again have rejected proposals for developing south of the river. On 4 separate occasions in the past 3 years the community have sent clear messages to Mr Duncan that Braehead is totally unsuitable for development. This view is supported by the current and proposed local development plans as well as the clear decisions passed down by Aberdeenshire Council today and last year. His tactics to wear down the community have only made more people aware of the controversy and woken people up to the “development at any cost” attitude displayed by many developers in Scotland today. We would ask that he now genuinely listen to the people in his own community and leave a legacy by taking steps to protect this area and ensure it is not subject to damaging development pressures in the future. 29.03.16 - Today the Marr Area Committee voted unanimously to recommend that Aberdeenshire Council reject planning permission at Braehead when they meet on April 28th. This echoes the results of last year's meeting where they also put forward 10 official reasons for refusal and sent a unanimous recommendation to the full Council. At today's meeting local Councillors were strongly against the repeat planning application that has set the record for the highest number of objections ever received in Aberdeenshire. 24.03.16 - A freedom of information request has this week revealed that the last two Braehead applications have each set the record for the highest number of objections ever received by Aberdeenshire Council. The current application received 634 objections knocking the previous Braehead application (525) off the top spot and receiving more than double the next highest application. The previous record had been set in 2014 by a controversial wind farm application that received 274 objections. 01.03.16 - Last night the site visit and Pre-Determination hearing was held for the new Braehead application. The comment period closed on 18th February and a total of 634 objections were submitted, an increase of more than 25% from last year. This significant increase in public objection to the plans was echoed by the Planning Department report into the application which listed the overwhelming reasons why this development should not go ahead. The next step in the process will be the meeting of the Mar Area Committee later this month where our local Councillors will finalise their recommendations following which the full Council will vote in April. Stay tuned into our Facebook feed for updates or drop us an email! 14.01.16 - We were informed today that due to an error in Sandlaw Farming's press notification the deadline for objections will now be extended to 18th February. The Pre-Determination hearing will go ahead as planned on Monday 29th February. 13.01.16 - Today we surpassed the number of objections received during the previous application in 2015. We now have over 550 objections and counting! 04.12.15 - A new application has been submitted by Sandlaw Farming for 300 homes on a smaller portion of the main Braehead site. The new plans vary very little from the application that was unanimously rejected by Aberdeenshire Council in June and we will post detailed analysis here in the coming days. We urge all those who objected last time to once again submit objections to Aberdeenshire Council and help to spread the word about these potentially damaging plans. Please follow this link for more information on the application including the objection form. 01.12.15 - Sandlaw Farming have withdrawn their appeal against the 400 home plans at Braehead, Auchattie. They have announced plans to submit a new application for 300 homes by next week. Stay tuned for updates. 18.09.15 - Sandlaw Farming have formally lodged their appeal against the unanimous June 18th decision by Aberdeenshire Council to reject planning permission for 400 homes at Braehead. The appeal information can be found on the Council website (APPEAL/2015/0034) and their supporting documentation can be found on the DPEA site here - https://www.dpea.scotland.gov.uk/CaseDetails.aspx?id=116985. In addition to this today Sandlaw issued a press release in which they stated their intention to submit a new planning application for 300 homes at Braehead. We will keep you updated as soon as more information is available. 18.06.15 - We are delighted to report that Aberdeenshire Council have listened to the community and planning department in voting unanimously to reject planning permission at Braehead. There are so many reasons why this was the wrong development in the wrong place and the Council acknowledged this in their decision today. Sandlaw Farming have announced their intention to appeal the decision and we will keep you informed of that process as it progresses. 15.06.15 - A final report into the application has been published by the Council ahead of Thursday's meeting - a copy of which can be downloaded here. The report echos the view of the community, local Councillors, the SDPA and Aberdeenshire Council Infrastructure Services in recommending refusal of planning permission at Braehead. The report states - "It is considered that development of this scale, in this location, on land not allocated for development, would have an undue and unacceptable impact on the landscape character and setting of Banchory...The proposal is clearly contrary to several policies of the LDP and arguments relating to the provision of rental housing are not considered to be a material consideration of such weight that would merit support for the proposal. The Planning Service therefore recommends refusal of the application." 04.06.15 - There are now only two weeks to go until the meeting of the full Council on June 18th where the final planning decision will be made. At this meeting Aberdeenshire Councillors will get the chance to vote on whether or not planning permission should be granted to Sandlaw Farming. We very much hope that they uphold the recommendations of the Marr Area Committee and the Planning Department in rejecting planning permission. You can get in touch with all 68 Councillors directly to let them know your opinions before June 18th, head to our Get Involved page to find out more. 07.05.15 - The Marr Area Committee met Tuesday 5th May and voted unanimously to refuse planning permission to Sandlaw Farming. These views will now be presented before a meeting of the full Council on June 18th where the final decision will be made. The opinions of the committee echoed the views of the planning department and further reasons for refusal will now be added to the report. 21.04.15 - The Pre-Determination hearing was held last night in Banchory with an overwhelming show of support in opposition to the Sandlaw Farming application. The application will now be reviewed by the Marr Area Committee on May 5th before being assessed in a full meeting of Aberdeenshire Council in June. 30.03.15 - The Pre-Determination hearing has now been set for 7pm, Monday April 20th at Hill of Banchory Primary School. The hearing is a formal process allowing those who have already submitted valid representations, as well as the applicant and consultees, to express their views to Councillors before any decision is taken. The Councillors will take all views on board before making a final decision on Thursday 18th June 2015. A site visit will take place before the hearing at 6pm on Monday, April 20th and all parties are invited to attend. 27.03.15 - The Proposed 2016 Local Development Plan has today been published by Aberdeenshire Council. This plan does not recommend any sites south of the River Dee in Banchory for development and Aberdeenshire Council want to know if we do or do not support their recommendations - which we do! Please download and fill in a comment form via this link and either email or post it back to the council. Sandlaw Farming will most likely be making strong representations that the Proposed Plan does not match their interests and it would be good for us to represent the other side of the argument. Also note that on April 20th there will be a Braehead site visit and pre-determination hearing for Councillors, Sandlaw Farming and all Objectors/Members of the public to attend. 06.03.15 - We would like to say a huge thank you to all of those who objected to and helped raise awareness of the Sandlaw Farming proposals! The comment period closed at midnight last night with over 520 objections submitted sending a clear message to both the Council and Government. The next stage in this process will be a "Pre-Determination" hearing that is set to take place in Banchory on April 20th. We are waiting to hear the final details on this and will let you know as soon as they become available. Also, on March 27th the Proposed 2016 LDP will be open for the final round of public comment. We expect that the developer will lodge strong objections to the fact that no development south of the River Dee was recommended and it may be useful to submit comments of support for the Council's recommendations. We will post all details both here and on our website when this period commences. Thank you once again for your continued support in this battle to stop unnecessary development and protect one of Banchory's most important assets. Stay tuned! 01.03.15 - Today the Sunday Times published their "Best Rural Places to Live in the UK" supplement and Banchory finished in an impressive 6th place! Of the Feugh Bridge the article said "visitors still flock here to see salmon leaping from the tumbling falls of Feugh". We have many concerns about how the development would affect this valuable and important attraction. The developer has proposed traffic lights at the bridge and stated that there would be an unavoidable increased safety risk given the significant increase in traffic. This is just one of the many issues that the development would raise and not one that would be imposed by the recommended sites within the Local Development Plan. 23.02.15 - The Aberdeen City & Shire SDPA (Strategic Development Planning Authority) responded to the application today, stating that "This application is significantly contrary to the Aberdeen City and Shire Strategic Development Plan (2014), which is up-to-date and relevant" and that "No robust evidence has been presented which suggests that additional housing land is required". We strongly support these statements and continue to urge all members of the community to object before the March 5th deadline. 18.02.15 - The Aberdeenshire Council Education Dept. today submitted their response to the application covering the impact that it would have on local schools. We welcome this response in which the department raised "concerns regarding safe routes to school" and stated that "Banchory Academy is already over capacity and this application on top of the housing already approved in the Local Development Plan would add additional pressure to primary education provision in the town". 16.02.15 - The Aberdeenshire Council Planning Dept. today submitted their response to the application which stated how the proposals contradict existing planning policies along with the proposed 2016 local development plan. The Council also stated that "the landscape impacts could be potentially significant" and that the development could "lead to adverse and irreversible impacts on the area". 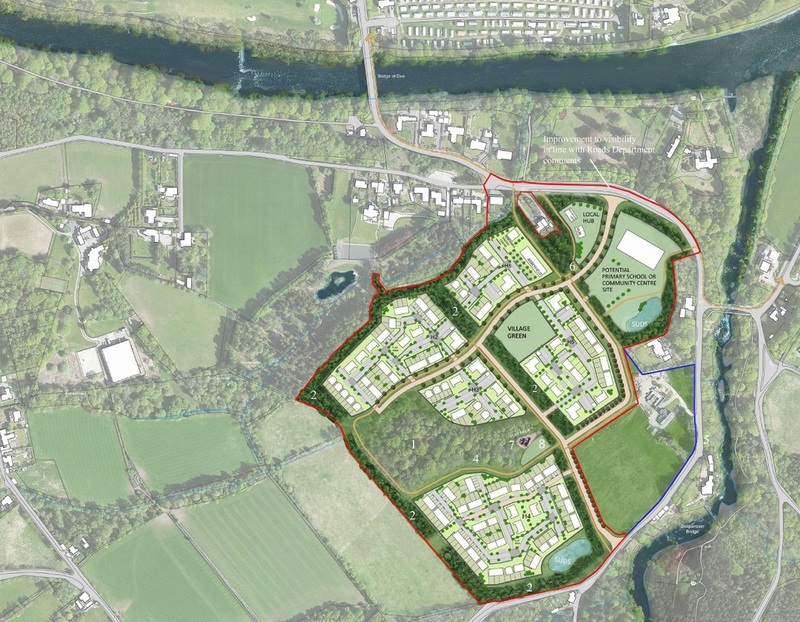 28.01.15 - Sandlaw Farming have submitted new proposals to the council seeking "Planning Permission in Principle" for a 400 home development on part of their Braehead site south of the River Dee in Banchory. The detailed supporting documentation makes clear reference to this being part of a “Masterplan" development for the area indicating that the original 700 home two phase proposal remains the goal for Sandlaw Farming. Objections can be made to the council before 05.03.15 and details can be found here on how to object.